On Wednesday, July 22, 1998, a large crop circle measuring 102 feet (30 meters) in diameter was found in a wheat field in College Ward, near the town of Providence, Utah (population 3,344). The formation consisted of a circle, rings and pathways. 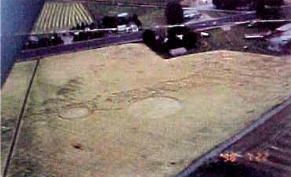 This was the second crop circle for Providence, where one appeared in August 1996. 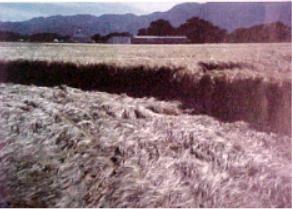 The Cove crop circle was discovered by cerealogist Ryan Layton of Davis County. According to the Deseret News, "Layton had rented a small plane along with researchers Con Olsen and Tres Nixon to get a better look at the College Ward formation." Layton, who has worked with Dr. W.C. Levengood on crop circle studies, "said the Cove formation is particularly intriguing because there are no visible tracks leading to it. He said Thursday he hopes to gain permission from the landowner to enter the field and study the Cove formation." The College Ward formation was described as a "flattened ring 102 feet in diameter, and a second ring measuring 46 feet, that is encompassed by two half- circles. Layton said the Cove formation had a large central ring surrounded by two more flattened rings and two circles, he said." "4 circles appeared over night in Glen Hansen's field of barley. It was first seen by Ryan Layton from a plane on the 22 of July . Another formation appeared just north in Cove, but the owner refused to let anyone in the field. It appeared to be one large circle about 100 ft. to 150 ft. in diameter with two small circles attached by small pathways on each side and two circular pathways not connected. We took 82 soil and plant samples that (hot)day. The large circle measured 95 ft. across, it had a 74 ft. in length and 4 ft. wide pathway that led to another 46 ft. circle, with another 68 ft. pathway and two 4 ft. pathways that led around the sides of the 46 ft. circle. At the bottom, there were two 30 ft. circles on each side. All the circles were woven counter clockwise. There were also many randomly downed crops on the west side of the formation, this was a spill- over of energy that was used to create the formation. Dr. Levengood found that most of the energy was centered on the middle 48 ft. circle. The plants and soil showed more change in the middle, such as expanded nodes and more stems extremely bent at the node. One very interesting thing I discovered was a green substance on the side of my van, I noticed it as I was getting ready to leave. Under magnification it appeared to have tiny luminous spheres. They had a bright green glow to them. (see photo) The nearest thing to this that has been found has been a white substance on cattle mutilations." 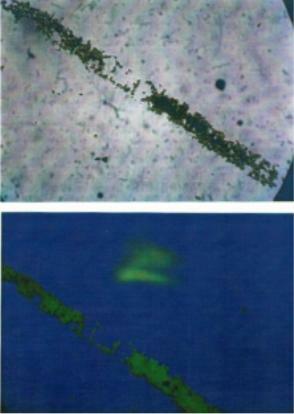 The substance contained titanium and silicon.